When you realise you are never going to change THE WORLD by yourself but that you can change your own world in almost any way any time you like... well, then you start looking at what needs changing in your own life which, hopefully has links to wider issues out in the BIG, WIDE WORLD out there. With luck and judgement your Butterfly Effect will end up altering this WORLD for the better, along with all like minded other 'yous' and if it is harmonic and resonant then maybe all will be well for our futures. Chaos theory and the sensitive dependence on initial conditions was described in the literature in a particular case of the three-body problem by Henri Poincaré in 1890. He later proposed that such phenomena could be common, for example, in meteorology. In 1898, Jacques Hadamard noted general divergence of trajectories in spaces of negative curvature. Pierre Duhem discussed the possible general significance of this in 1908. The idea that one butterfly could eventually have a far-reaching ripple effect on subsequent historic events first appears in "A Sound of Thunder", a 1952 short story by Ray Bradbury about time travel (see Literature and print here). In 1961, Lorenz was using a numerical computer model to rerun a weather prediction, when, as a shortcut on a number in the sequence, he entered the decimal 0.506 instead of entering the full 0.506127. The result was a completely different weather scenario. 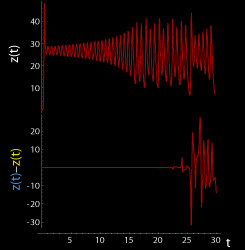 In 1963 Lorenz published a theoretical study of this effect in a well-known paper called Deterministic Nonperiodic Flow. Elsewhere he saidthat "One meteorologist remarked that if the theory were correct, one flap of a seagull's wings could change the course of weather forever." Following suggestions from colleagues, in later speeches and papers Lorenz used the more poetic butterfly. According to Lorenz, when he failed to provide a title for a talk he was to present at the 139th meeting of the American Association for the Advancement of Science in 1972, Philip Merilees concocted Does the flap of a butterfly’s wings in Brazil set off a tornado in Texas? as a title. Although a butterfly flapping its wings has remained constant in the expression of this concept, the location of the butterfly, the consequences, and the location of the consequences have varied widely. The phrase refers to the idea that a butterfly's wings might create tiny changes in the atmosphere that may ultimately alter the path of atornado or delay, accelerate or even prevent the occurrence of a tornado in another location. Note that the butterfly does not power or directly create the tornado. The flap of the wings is a part of the initial conditions; one set of conditions leads to a tornado while the other set of conditions doesn't. The flapping wing represents a small change in the initial condition of the system, which causes a chain of events leading to large-scale alterations of events (compare: domino effect). Had the butterfly not flapped its wings, the trajectory of the system might have been vastly different - it's possible that the set of conditions without the butterfly flapping its wings is the set that leads to a tornado. These figures show two segments of the three-dimensional evolution of two trajectories (one in blue, the other in yellow) for the same period of time in the Lorenz attractor starting at two initial points that differ by only 10−5 in the x-coordinate. Initially, the two trajectories seem coincident, as indicated by the small difference between the z coordinate of the blue and yellow trajectories, but for t > 23 the difference is as large as the value of the trajectory. The final position of the cones indicates that the two trajectories are no longer coincident at t = 30. A Java animation of the Lorenz attractor shows the continuous evolution. The definition does not require that all points from a neighborhood separate from the base point x, but it requires one positive Lyapunov exponent. The butterfly effect is most familiar in terms of weather; it can easily be demonstrated in standard weather prediction models, for example. The potential for sensitive dependence on initial conditions (the butterfly effect) has been studied in a number of cases in semiclassical andquantum physics including atoms in strong fields and the anisotropic Kepler problem. Some authors have argued that extreme (exponential) dependence on initial conditions is not expected in pure quantum treatments; however, the sensitive dependence on initial conditions demonstrated in classical motion is included in the semiclassical treatments developed by Martin Gutzwiller and Delos and co-workers. Other authors suggest that the butterfly effect can be observed in quantum systems. Karkuszewski et al. consider the time evolution of quantum systems which have slightly different Hamiltonians. They investigate the level of sensitivity of quantum systems to small changes in their given Hamiltonians. Poulin et al. presented a quantum algorithm to measure fidelity decay, which "measures the rate at which identical initial states diverge when subjected to slightly different dynamics." They consider fidelity decay to be "the closest quantum analog to the (purely classical) butterfly effect." Whereas the classical butterfly effect considers the effect of a small change in the position and/or velocity of an object in a given Hamiltonian system, the quantum butterfly effect considers the effect of a small change in the Hamiltonian system with a given initial position and velocity. This quantum butterfly effect has been demonstrated experimentally.Quantum and semiclassical treatments of system sensitivity to initial conditions are known as quantum chaos. ^ Mathis, Nancy (2007). Storm Warning: The Story of a Killer Tornado. Touchstone. p. x. ISBN 978-0-7432-8053-2. ^ Lorenz, Edward N. (March 1963). "Deterministic Nonperiodic Flow". Journal of the Atmospheric Sciences 20 (2): 130–141.Bibcode:1963JAtS...20..130L. doi:10.1175/1520-0469(1963)020<0130:DNF>2.0.CO;2. ISSN 1520-0469. Retrieved 3 June 2010. ^ "The Butterfly Effects: Variations on a Meme". AP42 ...and everything. Retrieved 3 August 2011. ^ Heller, E. J.; Tomsovic, S. (July 1993). "Postmodern Quantum Mechanics". Physics Today. ^ Gutzwiller, Martin C. (1990). Chaos in Classical and Quantum Mechanics. New York: Springer-Verlag. ISBN 0-387-97173-4. ^ a b Rudnick, Ze'ev (January 2008). "What is... Quantum Chaos" (PDF). Notices of the American Mathematical Society. ^ Berry, Michael (1989). "Quantum chaology, not quantum chaos".Physica Scripta 40 (3): 335. Bibcode:1989PhyS...40..335B.doi:10.1088/0031-8949/40/3/013. ^ Gutzwiller, Martin C. (1971). "Periodic Orbits and Classical Quantization Conditions". Journal of Mathematical Physics 12 (3): 343. Bibcode:1971JMP....12..343G. doi:10.1063/1.1665596. ^ Gao, J. & Delos, J. B. (1992). "Closed-orbit theory of oscillations in atomic photoabsorption cross sections in a strong electric field. II. Derivation of formulas". Phys. Rev. A 46 (3): 1455–1467.Bibcode:1992PhRvA..46.1455G.doi:10.1103/PhysRevA.46.1455. ^ Karkuszewski, Zbyszek P.; Jarzynski, Christopher; Zurek, Wojciech H. (2002). "Quantum Chaotic Environments, the Butterfly Effect, and Decoherence". Physical Review Letters 89 (17): 170405. arXiv:quant-ph/0111002.Bibcode:2002PhRvL..89q0405K.doi:10.1103/PhysRevLett.89.170405. ^ Poulin, David; Blume-Kohout, Robin; Laflamme, Raymond & Ollivier, Harold (2004). "Exponential Speedup with a Single Bit of Quantum Information: Measuring the Average Fidelity Decay".Physical Review Letters 92 (17): 177906. arXiv:quant-ph/0310038. Bibcode:2004PhRvL..92q7906P.doi:10.1103/PhysRevLett.92.177906. PMID 15169196. ^ a b Poulin, David. "A Rough Guide to Quantum Chaos" (PDF). ^ Peres, A. (1995). Quantum Theory: Concepts and Methods. Dordrecht: Kluwer Academic. ^ Lee, Jae-Seung & Khitrin, A. K. (2004). "Quantum amplifier: Measurement with entangled spins". Journal of Chemical Physics121 (9): 3949. Bibcode:2004JChPh.121.3949L.doi:10.1063/1.1788661. Devaney, Robert L. (2003). Introduction to Chaotic Dynamical Systems. Westview Press. ISBN 0-8133-4085-3. Hilborn, Robert C. (2004). "Sea gulls, butterflies, and grasshoppers: A brief history of the butterfly effect in nonlinear dynamics".American Journal of Physics 72 (4): 425–427. Bibcode:2004AmJPh..72..425H. doi:10.1119/1.1636492. Weisstein, Eric W., "Butterfly Effect" from MathWorld. This page was last modified on 27 March 2013 at 10:07.
projectbrainsaver is my attempt to add something worthwhile and positive to this World. projectbrainsaver is about sorting out the damage of the past in order that any footsteps taken from that moment on will be taken because they want to be taken by the person taking them. The primary aim is just to get a cleverer, more intelligent, more natural voice interface / QA / meaning based computing style setup for use by anyone who can communicate.